Production and field trial of the world’s first genetically modified pineapples with genetic constructs to control flowering time. These pineapples will allow farmer control over harvesting times. Dr. Botella’s research has two major foci: basic cell biology and applied biotechnology. In cell biology he is interested in studying the function of the Heterotrimeric G proteins in plants. This family of proteins is extremely important in humans but their role in pant systems is still largely unknown. 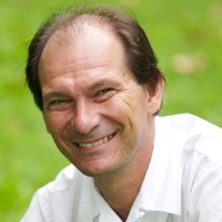 Dr. Botella’s research has strongly contributed to the current body of knowledge available in plants with critical contributions such as the discovery and characterization of the first plant gamma subunits and the establishment of these subunits as the critical element conferring function specificity to all plant G proteins. Dr. Botella’s team has also discovered the important role that these proteins play in defense against pathogens. New and unpublished data has now revealed that G proteins are important yield enhancing factors in crops such as rice. Another research interest resides in the communication between plants and insects. There is plenty of knowledge of how important smell, volatiles emitted by the plant, is for foraging insects in order to determine their host preferences. Nevertheless, most of the available studies have been performed using synthetic chemicals in artificial experimental settings. Dr. Botella’s team and collaborators have genetically engineered plants to produce different volatile mixes in the flowers in order to perform in vivo behavioral studies in insects. Biotechnology research at the Plant Genetic Engineering Laboratory mostly arises from discoveries made in basic research. The PGEL focuses in tropical and subtropical crops. These crops have attracted little attention in terms of biotechnology but are essential sources of food and energy for a large part of the world’s population, especially in Asia and the Indian subcontinent. The PGEL has developed a number of platform technologies that can be applied to multiple crops in order to confer resistance to pathogens, modify plant architecture and control flowering time. Can heterotrimeric G proteins help to feed the world? What can molecular biology do for postharvest technology? The other half of the G-protein story: Functional analysis of the plant G-protein gamma subunits. Benign strategies to engineer nematode resistance in plant crops. Applications to other plant pests. (1998) Republic of the Philippines: Dept Science & Tech. Characterization of Heterotrimeric G protein Gamma Subunits in Solanum lycopersicum cv MicroTom: Establishing the Functional Roles of a Novel Type B Gamma Subunit. FINDING CLUES TO THE FUNCTION OF THE UNKNOWN ARABIDOPSIS GENE AT2G47270.